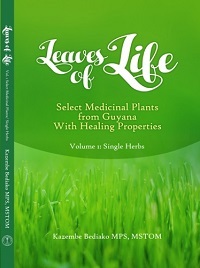 Leaves of Life, Volume1: Single Herbs also brings alive the myriads of medicinal multiple-purpose plants which can be employed in several ways at the same time. Many of the planted trees in Georgetown, the capital city, are utilized for fire and disease prevention purposes. The tropical broadleaf trees lining the streets are useful in preventing fire from spreading from one house to another for they do not ignite unless the heat first dries them. Also, many of the planted trees are important disease prevention agents for they drain pools of stagnant water with their roots; stagnant water is the breeding place for mosquitoes transmitting yellow fever, malaria and edema. Herbal medicine is now globally accepted as a valid alternative system of therapy. About eighty percent (80%) of people living in developing countries are almost completely dependent on traditional medical practices for their primary health care needs. Higher plants are known to be the main source of drug therapy in traditional medicine. It is further claimed that sixty four percent (64%) of the total population of the world utilizes plants as drugs, i.e. 3.2 billion people. Approximately, one hundred and nineteen plant based derived chemical compounds of known structure and derived from ninety species of plants are currently used as drugs or as biodynamic agents that affect human health. Nearly one-third of Americans engage in alternative medicine practices. Twenty-five percent (25%) of all prescriptions dispensed from community pharmacies contained active principles that were extracted from higher plants. In 1980, consumers in the United States paid more than 8 billion dollars for prescriptions containing active principles obtained from higher plants. Therefore, the potential for interactions with conventional medicine exists. Health is influenced by religion, society and environment. The World Health Organization (WHO) defines health as not only the absence of disease and malnutrition but also the positive wellbeing of the person. Ra Un Nefer Amen writes “all functions of the body, mind and spirit—and in all departments of nature are composed and regulated by two interdependent and seemingly opposite factors.” In the West, we call these structures positive and negative currents. In medical terms, it is known as anabolism (yin) and catabolism (yang). Anabolism corresponds to all the supportive nutrients and structural substances (blood, water, hormones, nutrients, etc.). Catabolism (yang) corresponds to the forces (electricity, magnetism, etc.) through which activity takes place. Diseases therefore arise as the result of the underlying malfunctions of the organs or imbalance of the yin and yang of the body, anabolic and catabolic. A Wiley-Interscience Publication: Ciba Foundation Symposium 154, Bioactive Compounds from Plants John Wiley & Sons: Great Britian, 1990; 3. Amen Ra Un Nefer. Healing is in the Spirit, Brooklyn: Khamit Media Trans Vision, Inc, 2010; 10.